Application with good and thoughtful error handling will probably use layered error handling scheme. That is, errors will first be raised as so-called low-level errors. 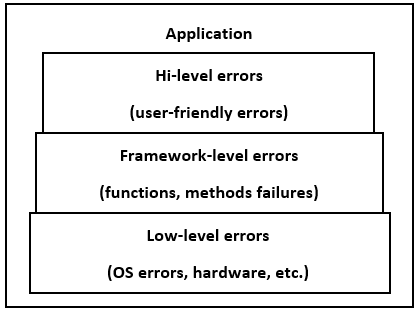 Low-level error indicates exact reason for failure - such as failures inside OS functions, hardware exceptions (access violation, etc.) and so on. Usually, you're interested in low-level errors to get precision information about failure (so you can resolve it). 1. Low-level errors from one piece of code are not different from errors from another piece of code. I.e. they are almost identical for any code in your application (access violation from any function is represented by the same EAccessViolation exception class). This does not allow you to build error handling logic which can differentiate between errors. 2. Error message of low-level errors are, well, "low-level" (such as "Range Check Error", "Index out of bounds", "Access Violation at address ... in module ... read ...", etc.). Such error messages may be good for diagnostic purposes for developers, but they are not user friendly. Normal users of your application could not read them. It would be better to show more friendly messages (such as "Sorry, I can not open your file XYZ, it seems damaged"). Note: Exception.RaiseOuterException construct is available only in RAD Studio 2009+. Older versions of Delphi and C++ Builder have to use "raise" and "throw" keywords. This example illustrates a good exception handling approach for frameworks and any middle-level code. Re-raising low-level errors as framework exceptions allows you to specify more information about error: such as file name and operation kind (i.e. open, read, etc.). Such information may not be available for low-level errors. This approach also allows you to provide more descriptive error message. 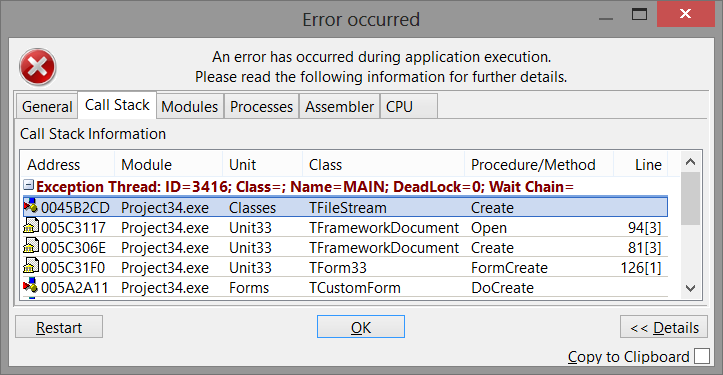 • Errors from TFileStream object are low-level errors. They are nested into framework exception classes. • Errors from framework are triggered by low-level errors. As you can see, low-level exception (nested) is the exception you're interested in. It indicates a reason for failure. This is what you typically want to be logged. Chained exception is triggered by original exception and provides more descriptive error message. So, you typically want to show it to user as error message. Thus, typically you want first exception to be logged, but last exception to be shown to end user. Classic/default Delphi and C++ Builder behavior is to work only with last exception always. Delphi 2009+ only: starting with Delphi 2009 - there was new features introduced to exceptions in RTL. Support for chained exceptions was added. There are new properties BaseException and InnerException as well as special raising construct. In this model, you need to use RaiseOuterException or ThrowOuterException to preserve original exception when raising new exception. EurekaLog implements similar model with the same properties, except it doesn't require you to use special raising construct. Any exception raising automatically saves previous (original) exception in InnerException property. This feature available on all supported IDE versions. Default behavior of Delphi/C++ Builder: show last (i.e. chained) exception and hide original (i.e. nested) exception. This behavior is what you want for user, but it's not what you want for diagnostic purposes. EurekaLog has the feature to change/customize this behavior. Options on "Nested exceptions" page allow you to customize EurekaLog behavior related to nested/chained exceptions. For example, if you're using Delphi 7 and disable both "Enable extended memory manager" and "Use low-level hooks" options - then EurekaLog will be unable to detect when exception object is destroyed. Thus, tracing nested/chained exceptions feature will not function properly. This means that you may get information about wrong exception in your bug reports. It's recommended to test your application when you alter "Enable extended memory manager", "Use low-level hooks" or "Capture stack only for exceptions from current module" options. If your application configuration fails to store proper information - please, switch nested/chained exceptions options into "Classic" positions instead of (default) "Recommended" positions.